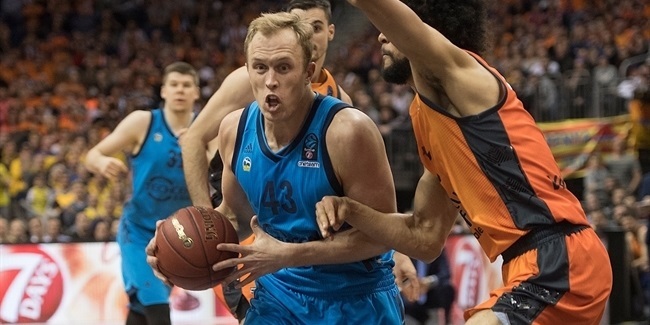 The second half of the 2018-19 7DAYS EuroCup Regular Season started with stellar individual performances but no-one did better than Erik Murphy of Fraport Skyliners Frankfurt, who earned Round 6 MVP honors with a PIR of 35. Murphy led the Skyliners to a 75-85 road win against Fiat Turin with a EuroCup season-high 33 points on excellent shooting percentages. Murphy hit 8-of-10 two-point shots, 5-of-6 from downtown and 2-of-3 free throws, adding 7 rebounds and 4 fouls drawn for a PIR of 35. 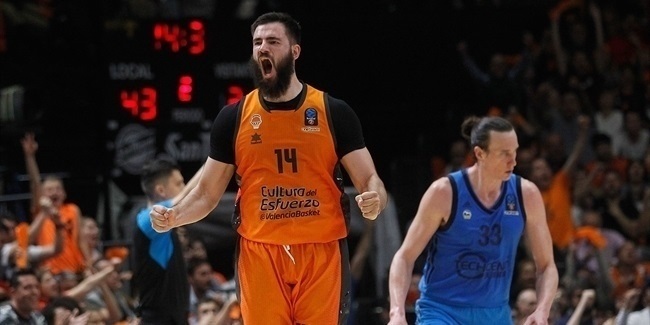 Uros Lukovic of Mornar Bar could not lead his team to a win against UNICS Kazan but had a near-perfect performance - 19 points on 8-of-8 two-point shots, 12 rebounds, 2 blocks and 5 fouls drawn for a PIR of 34. Diante Garrett of Tofas Bursa and Sylven Landesberg of Turk Telekom Ankara each had a PIR of 33 in Round 6. Landesberg led Turk Telekom to an 81-75 home win against Zenit St. Petersburg with 27 points on 8-of-12 two-point shots, 8-of-8 free throws, 7 rebounds, 4 assists and 7 fouls drawn. Garrett had a PIR of 33 in Tofas's 101-106 overtime home win against ALBA Berlin with 22 points, 6 rebounds, 11 assists and 3 steals. Dwayne Evans of ratiopharm Ulm, with a PIR of 31, complete the top individual performances in Regular Season Round 6. 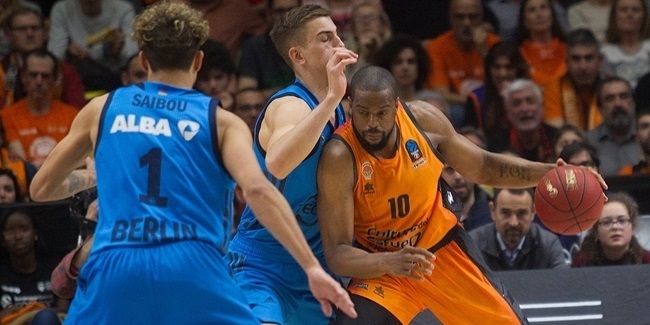 Murphy not only was the top scorer in Round 6, but also the first player to break the 30-point barrier in the EuroCup this season. Sergey Karasev of Zenit St. Petersburg (19.3 ppg.) is the current top scorer in the competition. Lukovic pulled down 12 rebounds to lead the weekly standings. He leads this season's standings (8 rpg.) along with Vladimir Stimac of Turk Telekom and Mouhammad Faye of Crvena Zvezda mts Belgrade. Garrett was the only player to register double digits in assists, dishing 11 against ALBA. Peyton Siva of ALBA, who is currently injured, still leads the assists standings at 10.3 per game. Green collected 6 steals against Zvezda and did that for the second time this season - no other player has been able to do so. He also leads the steals board at 4 per night. Ege Arar of Galatasaray Istanbul and Robert Upshaw of Arka Gdynia each had 3 blocks in Round 6. Upshaw is also first overall at 2.17 per game. Four players - Garrett, Lukovic, Evans and Jalen Reynolds of Zenit - registered respective double-doubles in this round.